The results are in on the 2013 Italian harvest and for those that enjoy a good Barolo, Chianti Classico, Primativo or Nero D’ Avola and hundreds of other Italian varietals, the news is good. You will of course have to wait until bottles of these favorites are ready to be shipped to theU.S.and other countries that enjoy a lovely Italian red. Balanced ripeness is what I read for 2013. All well and good, but our sights are set on vintages that are ready to drink now, such as 2010 , 2011 and to some extent 2012. So let’s launch our latest wine tour of the “boot” with new releases from an old friend, Castello Banfi inTuscany.It was a time of celebration for Banfi and the popular SolareItalian Restaurant inSan Diego. Recently a full house of diners was treated to the latest 2010 reds, affectionately called “Super Tuscans.” 2010 may be the finest vintage since 2001’s great year.The intensity is there, as well as rich, berry fruit in the Sangiovese base grape.For noble reds, the Summus Toscana with Cabernet, Merlot, Sangiovese and Syrahis as tasty as they come.Banfi is founded and owned by the Mariani Family, whose achievements inwine are recognized worldwide. Go tocastellobanfi.com. From icons to discoveries, two names to know inItalyare:Stemmari fromSicilyand Centanni from LeMarche. 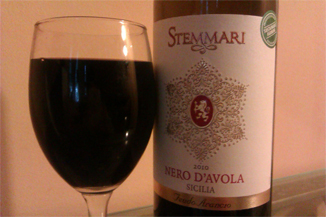 Stemmari is the new label of Feudo Arancio, a major Sicilian wine enterprise owned by northernItaly’s Mezzacorona, well known in theU.S.which buys half of its million plus cases per year, according to Wine Spectator.Stemmari has focused in on its Nero D’Avola,Sicily’s go-to wine.Its calling card is “Celebrate the Art of Living.” ($9.99)Other varietals in the Stemmari selections include:an elegant Pinot Noir, a Pinot Grigio, a Moscato and two blends, Dalila and Cantodoro. All are $9.99 with the blends at $13.99. Go tostemmari.it. Jonathan Zeiger is a young, fresh face distributing a growing list of new Italian names for us to know in SoCal.His ZGR Imports specializes in wines from the Le Marche district of Italy, including Centanni.As I write this he is working hard setting up buyers at the largest wine event in the country, VinItaly.The first thing noticed about Centanni bottles is that they use the fascinating VinoLok glass tops.These “eliminate the risk of cork taint, allow for easy opening and resealing, minimize additional oxidation on an open bottle and are aesthetically pleasing.”The wines that I favored include:Pecorino 2012 with 100% Pecorino grapes ($28.99) and Monte Floris 2011 Marche Rosso with 100% Montepulciano grapes ($28.99).Go tozgrimports.com. Next articleLobster Mac is Back!